Prerequisites Instructors Testimonials FAQ REGISTER! This evidence-based course on management of edema --including lymphedema-- was developed by the Oncology Section of the American Physical Therapy Association. 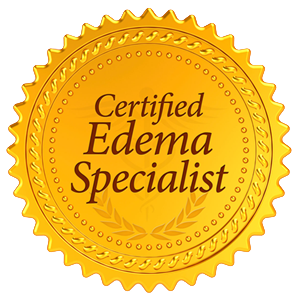 Successful participants will receive certification in the management of edema from the Oncology Section and will be designated as Certified Edema Specialists (CES). This certification will be part of the new Certificate of Achievement in Oncology Physical Therapy (CAOPT) through the Oncology Section. Peripheral edema is a common impairment secondary to many medical diagnoses encountered by physical and occupational therapists across all practice settings. Differential diagnosis of the cause of the edema is essential in the clinical reasoning process that leads to appropriate intervention. This case based course will address the pathophysiology, examination, evaluation and clinical management of peripheral edemas of the upper and lower extremities, head, neck, and genital areas. The course utilizes an online format to present didactic material that must be completed prior to attendance at a regionally located lab. Active learning strategies include small and large group discussions of patient cases to facilitate integration of the didactic material into patient care. Feedback will be provided during supervised labs for manual lymphatic drainage and multiple layer compression bandaging. Joint and soft tissue mobilizations and therapeutic exercise will be incorporated into case discussions and labs. Patient cases incorporate a variety of pathologies that result in peripheral edema. The interventions presented are appropriate for orthopedic related edemas, organ–related edemas as well edema due to chronic venous insufficiency. This course is applicable across all treatment settings: acute care, home-health, out-patient orthopedics, sports medicine clinics, rehabilitation hospitals and SNFs. Successful participants will receive certification in the management of edema from the Oncology Section and will be designated as Certified Edema Specialists (CES). The following online courses must be completed prior to the workshop; once completed, please bring your certificates to the workshop. This portion comprises approximately 18 hours of learning at your own pace and at your place. This state of the art didactic material was developed by the Oncology Section and offered online by EDUCATA. It is organized into 4 modules. Click on the image for each course. Click “Enroll Now” to add to your cart. Repeat until you have added all 4 courses to your shopping cart. For those planning to attend the USC Verdugo Hills event, enter the coupon code CES-VHH and press "Redeem". Marisa Perdomo, PT, DPT, MS, CCES, CES is an Assistant Professor in Clinical Physical Therapy at the University of Southern California and has over 30 years of clinical practice focusing on orthopedic, oncologic and lymphatic dysfunctions. Learn More. Lisa VanHoose, PT, PhD, MPH, CLT, CES received her PhD in Rehabilitation Science and MPH from the University of Kansas Medical Center. She completed the NHLBI PRIDE Summer Institute with an emphasis in Cardiovascular Genetic Epidemiology. Learn More. "Their teaching style is great and not intimidating. They welcomed discussion and are open to new ideas, breaking down the CDT treatment and making it much less dogmatic and overwhelming than previous courses that I’ve attended. I have more confidence as a clinician, especially when dealing with more complicated cases. My patients are able to learn their HEP much faster and with a lot less stress. I continue to be excited each and every time I have a patient with lymphedema or orthopedic edema on my schedule. I have noticed a huge difference in my post-op total joint population after using techniques I learned at the CES course. I’ve been able to expand my marketing to orthopedic surgeons for my orthopedic edema management program. I use the skills that I learned at the CES every day. The instructors’ passion for teaching and treating this patient population really shows and is infectious." "A highly-recommended, evidence-based and focused course with tons of information. The instructors were so dedicated and helpful that they made such a heavy course really enjoyable. Worth the money AND the journey. Thanks." “I completed the Comprehensive Management of Peripheral Edema course in January 2017. This was a transformational course. I finished with a high degree of confidence in my skills and knowledge to take back to my clinic to make a difference in my clients’ lives.